The power of positive nepotism! I was going to say “inexpensive room & board in exchange for a family of bughunters”… but the board part is covered by the bughunting. Still, it’s a win/win situation! There is Leroy. He is a hivemind that wears a person suit. If it ever punctures there will be SPIDERS EVERYWHERE. Just don’t invite Shelly over anytime soon. AH! but the real question is: Is Monica surprised at the $750 meaning that she never really paid that much attention to the bill itself, and didn’t know she was paying that much?? or the fact that she SAVED that much as compared to LAST YEAR’s expense, which was probably even HIGHER!? She’s surprised that she’s going to be paying nothing this year, I think… Digit is saving her all of what she paid last year. Guesticus: Yeah, but you can’t pay your bills with that. They get paid in a safe place to live and hunt. Spiders are often found hanging around online. Well — providing it/they place webs in locations that catch bugs, but don’t get humans trapped in them (like across doorways or walkways). Yay for natural pest control! Give em a place to live and they are more than happy. I wish I had a few more around to help out with the fruit flies that pop up every year. 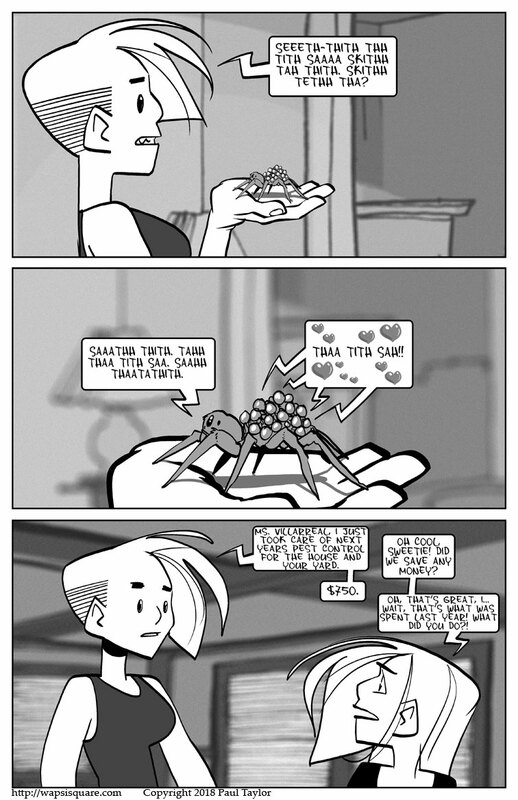 I’d gladly let a few spiders live in my place. somewhere back right after Digit became human shaped there was a strip that showed her saying something in spiderese (like one word maybe two) and then repeating in English… a LOT OF ENGLISH like 20 to 1 or something… in other words the first two panels might take a months worth of strips! equal to the pest service charge. When we first moved into our house, we occasionally came across small spiders that would hop around near the exterior doors and windows, usually in late winter/early spring. We thought they were really cute so we always set them free outside. Turns out they were baby tarantulas that are most efficient at gobbling up pesky scorpions. So rather than freak out when we occasionally saw a huge furry tarantula crawling up the side of the house, we took it as a sign that our scorpion population control program was working. Oh, she’s going to lose her mind come later in the year when she sees all the webs. Digit basically called out a hit on any insect unlucky enough to wander near M’s house. So Digit was transformed by Fae magic. And so was Hiroshi. So Castela could cure Digit too? Not neccesarily. Hiroshi is only half-Fae, while Digit has a broken Fae talisman incorporated within herself. Maybe Castela’s root beer might help Dietzel. Digit has a great money-making business. Just advertise organic bug killer, no chemical spray and pet-friendly.